The SEMPA technique was first introduced by Koike et al in 1984. It uses the spin polarization of secondary electrons which are emitted from the samples surface when hit by a primary electron beam to generate a magnetic image (compare figure). Our setup is based on a Zeiss Gemini UHV SEM (Scanning Electron Microscope) which has a resolution of 3nm. For the spin detection a SPLEED (Spin Polarized Low Energy Electron Diffraction) is incorporated. It uses the spin-dependent diffraction at a W(100) single crystal surface. For magnetic imaging a resolution of about 20nm is specified. SEMPA is a highly surface sensitive technique and measures an absolute magnetic signal: the polarization of the secondary electrons. 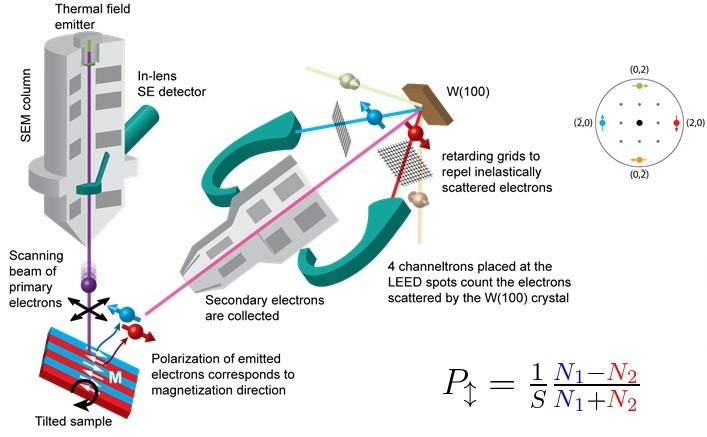 Furthermore, by counting the electrons in all 4 main LEED spots, one obtains simulatenously images of the topography and the two polarization components parallel to the crystal surface. The technique has a surface sensitivity of less than 1nm, which allows the selective imaging of surface magnetization. To provide the required clean surfaces, our setup is equipped with a dedicated preparation chamber where we have the facility of in-situ sample preparation via an Ar sputter gun & three evaporators. For more complex samples a vacuum transfer chamber can be used to minimize surface contamination between external growth chambers, such as the pulsed laser deposition system, and the SEMPA. 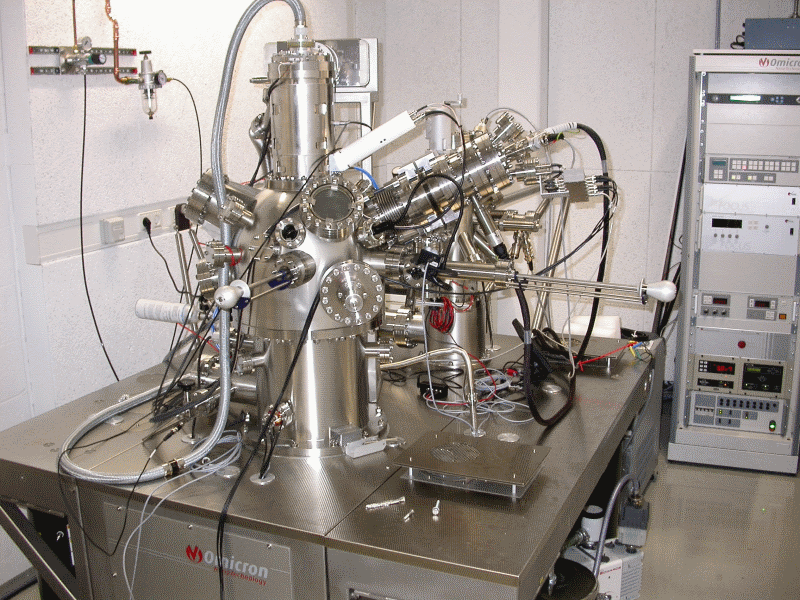 The system is further equipped with 4 electrical contacts to allow the steady-state imaging of magnetization following current excitation and a liquid helium flow cryostat which provides a temperature range between 30 and 450 K for the measurements. 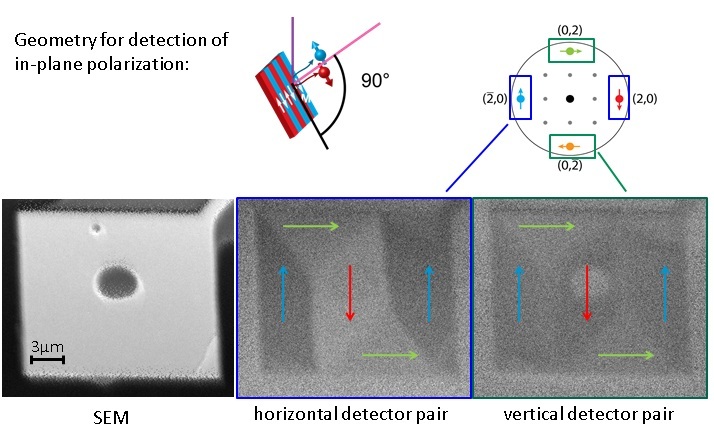 Since permanent magnetic fields cannot be applied during imaging, a magnetization stage provides the ability to initialize the magnetic state of a sample with magnetic fields up to ~80 mT.